BELIZE CITY, Belize District, Thurs. June 30, 2016–While one man lies in the morgue, another lies in bed fighting for his life at the Karl Heusner Memorial Hospital (KHMH) after another night of street violence. 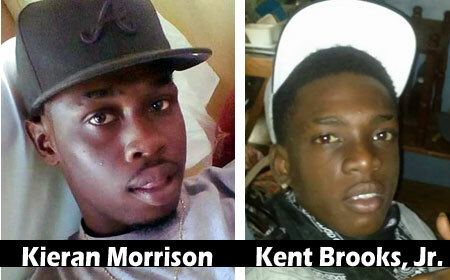 Kieran Morrison, 20, and Kent Brooks, Jr., 18, were both socializing at the Morrison’s residence on Lacroix Boulevard shortly after 8 p.m. on Wednesday when a gunman exited a grey car and fired several shots at the duo. Morrison sustained injuries to the head and neck, and died as a result of these wounds, while Brooks, who was shot in the stomach, remains in a critical condition. According to the Commander of Eastern Division South, ACP Chester Williams, this incident was gang-related. At this time, we are unable to confirm that in fact, these two young men were involved in gang activity. However, information to Amandala suggests that both men were the latest casualties of a feud that began some time ago between the Bloods of the Peace in the Village (PIV) gang and the Backa Lands Crips (BLC). Morrison’s older brother, Kingsley “Dj Vybz” Morrison, had survived an ambush in 2015 on this very same Lacroix Boulevard, during which his cousin, Michael Welch, was slain. In the last two years, several of the men’s acquaintances, such as Myron ”Saddest” Smith and David Steven Rivas, have been eliminated by gun violence. “I have never seen a generation of young people who are so willing to die. “They have no regard for their life or for the lives of others. I am sure they all knew from the time they ventured into gang activities what the outcome would be, and despite that, some of them still ventured down this road,” lamented ACP Williams at his press conference today. When Amandala spoke to the father of Brooks, Jr., he told us that doctors have given his son a twenty to thirty percent chance of survival. He revealed to us that several of his son’s organs were ruptured as the bullet travelled from his abdomen down into his leg, damaging one of his main veins. He told us that he knew of the ongoing “beef” between some of his son’s friends and other young men from the BLC, but said that this was the first time that his son had gotten into an incident of this magnitude. Brooks, Sr., 48, is appealing to all the young men in his community for peace, while at the same time hoping for his son’s survival. Amandala contacted the Morrison family for comment, but they courteously declined.